as first name or phone number). 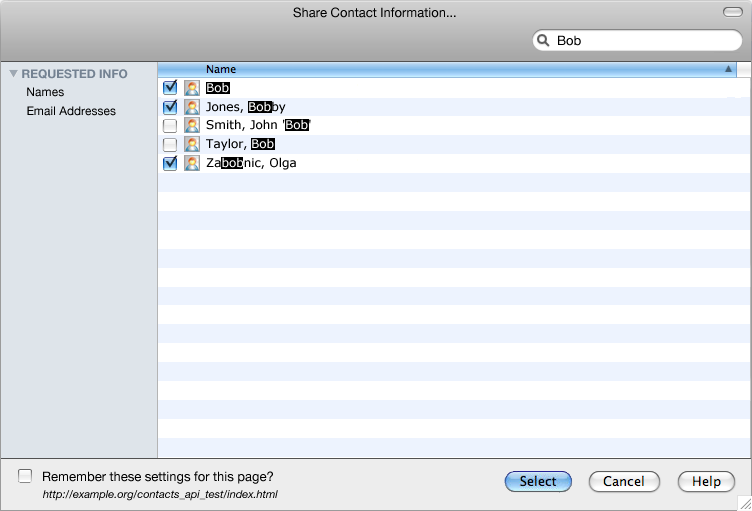 serviceId URL to interact with the remote contacts database. detract from the technical content and testability of the API spec itself. discuss them on the mailing list in my absence. > in April, with a target of a Last Call draft in June. > the time to include them in the document? Next message: David Rogers: "RE: Policy requirements question (was Re: RE: [Powerbox] New draft based on further collaboration and prototyping)"
Previous message: James Salsman: "Policy requirements question (was Re: RE: [Powerbox] New draft based on further collaboration and prototyping)"
In reply to: Dominique Hazael-Massieux: "re-publication of Contacts API"
Next in thread: Dominique Hazael-Massieux: "Re: re-publication of Contacts API"
Reply: Dominique Hazael-Massieux: "Re: re-publication of Contacts API"